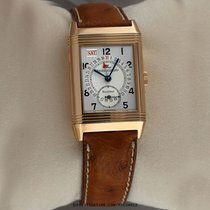 18ct pink gold Jaeger-LeCoultre Reverso Date 270.2.36 Mechanical hand wound JLC 836 movement. Case dimensions 42mm x 26mm. Silvered front dial with Arabic numeral hour markers and blued steel hands. Functions: Day, Date, Hours, Minutes and Small Seconds at the 6 o'clock position. 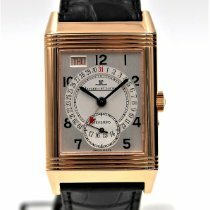 The design of the red hand indicating the date was inspired by the Jaeger-leCoultre calendar watches of the 1940's and 1950's. 45 hour power reserve. 21,600 VPH. 18ct Rose Gold bracelet with folding clasp. Box and Papers.